Working for a not-for-profit organisation has its charms as well as challenges. Among the positives, there are considerable more opportunities innovate, to choose a different path, and even do something audacious. On the flip side, there’s never enough money, enough people, enough resources, enough anything. For the same results, the corporate and the government sectors pay more. On the balance, I think, those who prefer the not-for-profit sector do so because of the freedom it offers. Running a not-for-profit requires better skillsets than running a private or government sector organisation because you’re expected to do everything. But there are few, if any, opportunities for training. The Toronto-based Maytree Foundation’s 5 Good Ideas is a training program for those who work at not-for-profit organisations. It’s simple, effective and free. I’ve attended a few of these sessions and have always benefited from them – both from the main speaker as well as from the exchange of ideas that emanate from the group that I sit with. But with all such workshops, there’s always a problem of retention. There’s a lot one learns, but not everything stays with you. And there’s never enough time to compile notes from the workshop and keep them handy for reference. 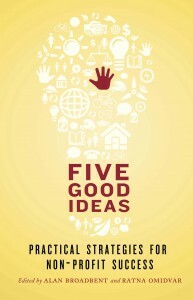 With the publication of Five Good Ideas, Practical Strategies for Non-Profit Success that problem is solved. Edited by Alan Broadbent, founder chairman of Maytree, and Ratna Omidvar, President of Maytree, the book is a manual for all professionals working for not-for-profit organisations. 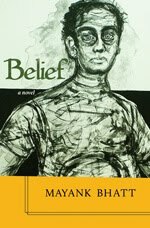 The scope of the book is exhaustive. I doubt if any aspect of a not-for-profit is left uncovered. But instead of a tome full of treatises, the book is an easy-to-read compilation of five good ideas on seven issues that a professional working for a not-for-profit organisation encounters daily. All the contributors are stalwarts in their chosen field of expertise. If you have anything to do with a not-for-profit, read this book. Thanks very much for taking the time to write a review, and thanks for your kind words about our program and book! We really appreciate it!